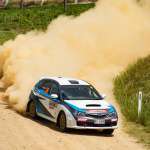 New names, new cars and plenty of familiar faces are preparing to battle it out in the opening round of the CAMS Australian Rally Championship on 5-7 April. With the first stage less than two weeks away, 48 crews are preparing to take on the fast Western Australian roads at the season opening Make Smoking History Forest Rally. The confirmed entry list makes for some interesting reading, with Toyota Gazoo Racing’s Harry Bates and John McCarthy set to be first on the road in a new Toyota Yaris AP4. They’ll be followed by two new G4 class cars in Shamrock Haulage’s Richie Dalton and Dale Moscatt and Up & Go Emergency Tyre Repairs Justin Dowel and Simon Ellis. Harry’s brother Lewis will compete in the second Toyota Gazoo Racing AP4, with the younger Bates making the step up from the Toyota Corolla S2000. 2016 CAMS ARC Champion Molly Taylor returns alongside Malcolm Read in a brand new Subaru WRX STI, with the pair likely to challenge for the title thanks to some new tweaks to the car wearing the famous Subaru rally colours. See the full entry list here. Last year’s ARC runner up and Kennards Hire Rally Australia round winner, Steve Glenney will make a surprise move to the co-driver seat, joining 2018 debutant Luke Anear, who put in an amazing performance to finish second at Rally Australia late last year. With the experienced Glenney alongside, Anear will be hoping for a big year in the Subaru Impreza STI. West Australian John O’Dowd will compete in the only R5 car in the forests near Busselton, with O’Dowd sitting alongside experienced co-driver Toni Feaver in the Truck Wholesale WA Skoda Fabia R5. The Skoda won plenty of fans in last year’s Championship, with Evans showing its rally winning ability throughout 2018. J Sport’s JJ Hatton and co-driver Nathan Long return to ARC action after a strong showing at Rally Australia, this time in a faster Hyundai i20 G4. Rounding out the ARC entry list are Maximum Motorsport’s Tom Wilde, Right Piece Auto Repairs’ Kevin Raedel and Hauwen Chu who returns for his second full season in the Championship. A host of other drivers will compete across the ARC, CAMS Western Australian Rally Championship (WARC) and Clubman Masters and Clubman Cup, with a selection of famous rally marques on show throughout the weekend. While Wilde and O’Dowd will be also be vying for points in the WARC, they will be up against 25 other crews including 2018 runner-up Stephen Oxley, Kody Reynolds and reigning ARC champion co-driver Ben Searcy who makes the big switch into the driver’s seat for the state championship. There will be no number 1 at the first national rally of 2019, with reigning champion Eli Evans choosing not to recontest the Championship in full this year. The first action at the Make Smoking History Forest Rally gets underway at the Super Special Stage at Barnard Park in Busselton on Friday evening, with fans and spectators given the opportunity to get a close look at the cars at the free event.